This article explains the basics of the OPNsense Graphical User Interface or GUI for short. 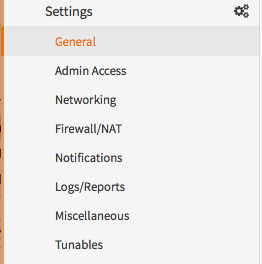 Before we can take a look at the GUI options we need to login. The default user is root and the password is opnsense. 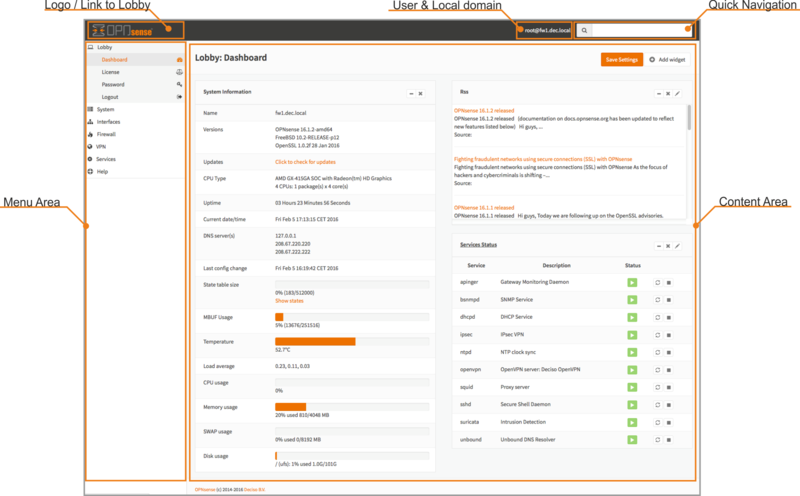 Click on the OPNsense logo wherever you are in the interface and you will be directed to the lobby and dashboard. The Menu area holds all the primary menus and submenus. Here you can select what part of the system you want to watch or change. A faster way to navigate trough the GUI is by using the quick navigation/search box on the upper right corner of the screen. Either click on it or hit tab to select it. The search field is a type-ahead field, meaning that it will guess what you are looking for and fill up while typing. Hit Enter or click on an option to select and navigate directly to the right page. 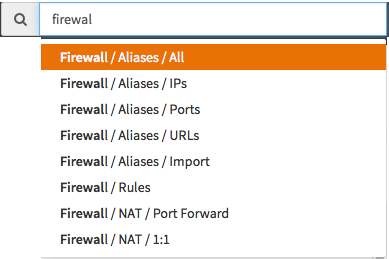 In the right corner just to the left of the quick navigation you will see your username and the full domain name the firewall is configured with (to change firewall name, go to System ‣ Setting ‣ General). Many forms are equipped with built-in help. In the upper right corner of the form you can select to view all help messages at once. The toggle will color green when enabled and show the help messages beneath the input items. 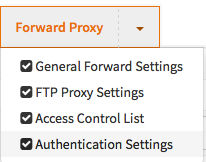 Some forms have hidden advanced features, to view them toggle the advanced mode in the left corner of the form. Doing so will reveal all advanced options. A standard tab can be clicked upon to open the corresponding form.